The custodian of a shrine in Sargodha and two accomplices have been arrested for intoxicating and murdering 20 devotees and injuring four others with batons and knives early Sunday, police said. Four women were among those killed in the attack at the shrine to Mohammad Ali, according to police, who said they had arrested three suspects including the custodian. The motive for the slaughter was unclear but some officials said the chief suspect had mental health problems and had used violence on followers before. “The 50-year-old shrine custodian, Abdul Waheed, has confessed that he killed these people because he feared that they had come to kill him,” regional police chief Zulfiqar Hameed told AFP. 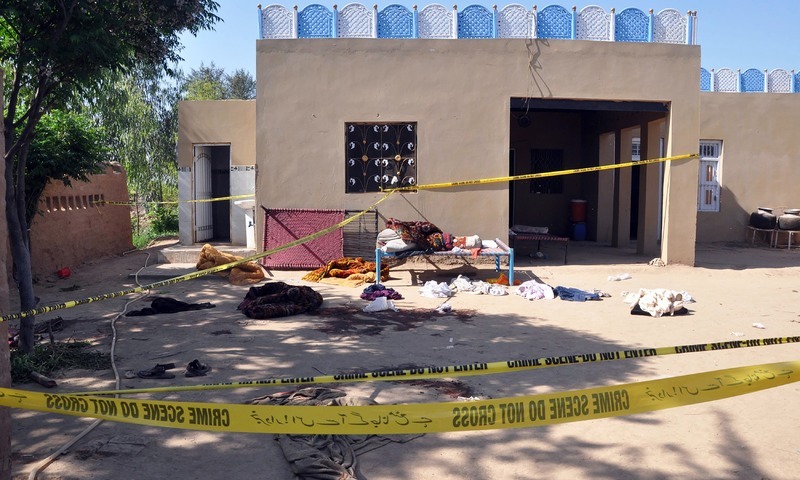 “The suspect appears to be paranoid and psychotic, or it could be related to rivalry for the control of shrine,” he said, adding that the investigation into the killings near the city of Sargodha was continuing. “We suspect that the victims had been given some intoxicants before they were murdered, but we will wait for a forensics report to confirm this suspicion,” he added. Joya said the shrine was built in the area some two and a half years ago. Sargodha Deputy Commissioner (DC) Liaquat Ali Chatta claimed that Waheed, believed to be a resident of Lahore, was a one-time employee of the Election Commission of Pakistan. He took over the shrine after its completion. Local rescue service official Mazhar Shah said Waheed used to meet devotees once or twice a month and used violence to “heal” them. “Local people say that Waheed used to beat the visitors who came to him for treatment of various physical or spiritual ailments,” Shah told reporters in televised comments. 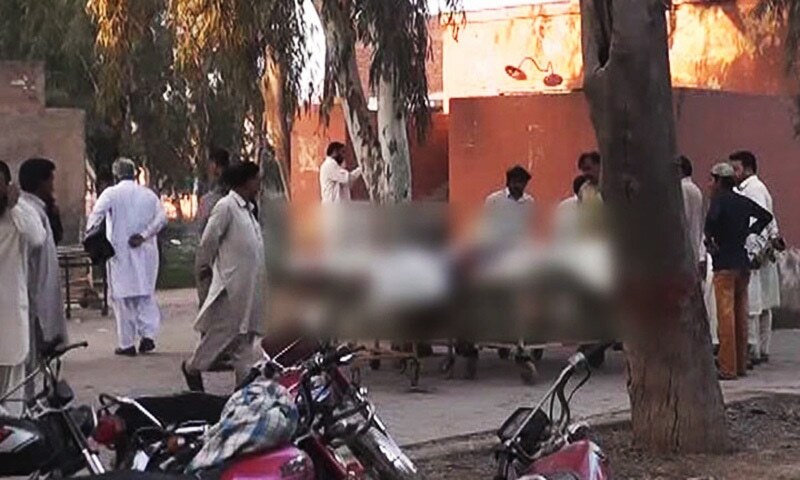 The attack was reported by an injured woman who arrived at District Hospital Sargodha, DC Chatta said, adding that she was one of four survivors who managed to flee from the scene of the crime. Television footage showed scattered shoes, clothes, sheets and cots in the yard of the white-painted domed shrine as police vehicles and police commandos surrounded the premises, sited amid green farmland. Acting on the information, a heavy contingent of police rushed to the shrine and arrested Waheed and his alleged accomplices, he said. Chatta said that the shrine custodian seemed “mentally unstable.” He added that the custodian was allegedly in the practice of “beating and torturing” devotees to “cleanse” them. Quoting the survivor, the deputy commissioner alleged that the custodian had contacted devotees via telephone and summoned them to his room one by one. He claimed that the custodian had offered an intoxicating substance to his victims before removing their clothes and stabbing and beating them to death. 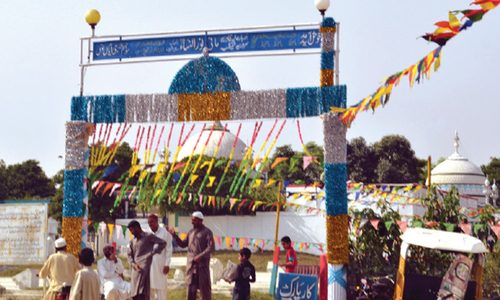 Qadri said that his department managed some 552 shrines in the province, but this one was not a registered with it. “Investigators will also look into how this shrine was allowed to be set up on private land,” he said. Punjab Chief Minister Shahbaz Sharif has asked for a police report on the investigation within 24 hours, a senior government official said. 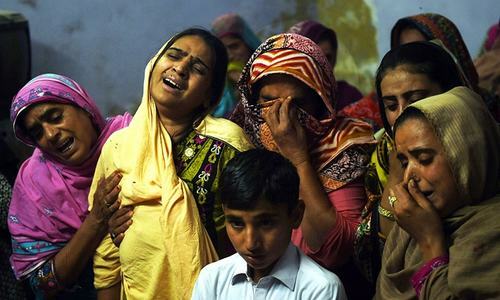 The chief minister announced that Rs0.5 million will be given in compensation to the families of those who were killed in the attack, whereas compensation of Rs0.2 million will be given to the injured. what could have been the motive. All such dubious shrines and their custodians should be dealt severely under the law. People may also be aware to these professional so called spiritual leaders . This story makes absolutely no sense. How can one man armed with a dagger kill 19 and injure 3 people, even if these 23 people were unarmed. And why was he calmly waiting around for the police to arrest him. Custodian was mentally unstable. Was this trgedy avoidable?. Another terror attack just like the last wave months back.? What is going on in Pakistan?! No value of humans in South Asia. Crime and faith don't go hand in hand, why are our people so ignorant about such crimes..? For all terrorist attack only solution close AfPak border. Mindless killings is causing deep distress. Illiteracy at its peak.we need more schools. Seal the border with Afghanistan please. Didn't I tell you before the security situation of ordinary citizen is worsening every day. How sad! When will the nation get rid of the acts of the days of ignorance? @Abood - More schools? No. We need Orange, Red, Blue, Pink, Black Metros. That will help a lot. Not a single day is passing without extreme violence So sad. @Javed Arshad You guys are very literate persons, why do you need more literacy, Your Madrasa knowledge isn't enough or Do you really want to enhance your skills in science and technology? Typical reactions: 1. Afghanis are responsible. 2. Indians are responsible. 3. Western conspiracy. Something is wrong its seems Punjab Govt is hiding the actual story. Mentally unstable and employee of Election Commission of Pakistan. What remains to be said. Unfortunate killings. @Rabia irshad When we become less religious and more human. The purpose of the killing had not been informed. When the person planned the murder as informed he cannot be mentally unstable. Secondly what he did to the valuable of the victims had not been informed. How 19 bodies was recovered on first and how the 20th body recd. after ward show that he must have hide the bodies. why the killer removed the cloths and then kills the victims? This all question still unanswered. The person like me can have all such question the person like police in charge must have more than I am thinking. Is he hiding some thing? let the time proves. It appears to be a well planned massacre which is being passed on as a mental disorder incident. @Sohail Khan Wazir how border closing will help here. The very shocking incident of 20 people's killings can not happen without any serious cause which should be revealed conducting investigations. It is a horrible crime and it is sadder still because it happened in a shrine. I hope a thorough investigation will be made to ascertain the real cause. No plausible reason has been given in the report for this mass killing. Branding the killer as mentally unstable makes it very easy for the area police to 'solve' the case. Dear Pakistani , if you love your country , please have check on that , nothing BAD than this-one. @ ABOOD, very true my friend. Not only Pakistan, the whole subcontinent needs more and more schools. Strictest form of secular and scientific education must be implemented at all costs. Religion to be restricted as a private matter as Mr. Jinnah and Mr. Ambedkar proposed. This is high time. Ideology is turning into a violent practice. A government employee custodian of a shrine ? How come that ? He had been beating the devotees in the past. How did this remain unnoticed and unreported ? This incident requires thorough investigation as well as suitable action against the employee and the department he belongs to. How can a mentally unstable person plan and carry so many murders?. It takes serious amount of time for each murder. He was stable for doing 20 of them. Premeditated murders. Whatever it is a sad state of affairs. Looks like a terror attack, Pinjab government is trying to cover this up so as to look clean and more vigilant when it comes to prevent terror attacks !! @Horseman you left Israel out of the picture. It's funny that most educated people here are busy giving us lectures daily on democracy, secularism, and all those things they have never experienced in their own country and do not understand themselves. Our problem is that we regularly silent those who talk for rights,justice,sense,religious tolerance and modernisation and finally we get these outcomes.The time is for openness in our society.In our society teachers, professors and civil society are being regularly harassed so that we remain in dark ages and remain a security state like Syria,Iraq and Egypt. Government is least interested in the people. There is no semblance of law and order in the whole of the country. Why are Punjab and Sindh - the two largest provinces by the two largest political outfits like PPP and PML-N are constantly in the news - for all the wrong reasons? What is happening in Pakistan, need serious introspection their past policies. People in power are all very busy, looting the country. Rulers are busy looting the country. Extremists are busy killing the people. Government is silent as usual. These killings appear to be by someone mentally deranged, but there is not much of a difference between such madness and the religious madness of the terrorists. @Horseman 100 percent right! There is no learning only deny - so no change! This is ugly, these shrines needs to be properly regulated as they are becoming cover for loads of illegal activities. Innocent poor people are being exploited in the name of religion, drug addicts and dealers are using these shrines as safe heavens. Moreover many other immoral and illegal activities are finding breeding ground around these shrines. Whether you accept it or not, all is not well in Pakistan. Weapons are more easily available than food. As usual, there are some people who will always say it is the job of the neighboring countries and close the matter. Either it is Ostrich attitude or they are sadists. @anees zed NO,no. Ghost schools, vandalised hospitals or hospitals built by donations but to immortalise our own names, will definitely help! Communication? Why don't you walk from Dera Gujran upto Shahdra for work or walk to Govt. college or Islamia college or Punjab Secretariate or Myo Hospital? Central London is clean, spacious,even in Piccadilly the small side streets are at least two lane.Why? Because of good communication in the form of overground British Rail, Underground, separate Bus lanes,motorways starting from the centre of London, people can live as far as Reading and still can be at work in time. Is this story correct ? Really hard to believe ! Sad to see not many comments here. May be life has become too routine for the people. Why is the govt compensating the victims. A very sad incident but it has got nothing to do with other countries. Why some people are after the closing of Pak-Afg border? A true example of blind faith and ignorance. Islam doesn't approve of such actions whether for religious or personal purposes. @Thunder custodian is a Pakistani employed by pak government. What seal the Durand line. The problem is you don't see the trouble within. Sad for the loss of innocent lives. @GENGHIS khan no. They have conveyed their deep 'sorrow'!!! Need for registering and monitoring such places is highlighted time and time again by such cruel incidences. it's anyones guess in a world where there are criminals in all states...who know, who cares? it's usually lies. This will be big news for at least 3 months in any country. It will be forgotten in less than 3 days here..
Gen Raheel please come back. Pakistan needs you more than ever now. It is time to control secretive cults and hate preachings. sir, police story does not go under the throat. @Horseman ... Indeed Horseman sb., everybody else is to blame except ourselves. We simply do not take responsibility. @GENGHIS khan ... array Khan sb., there isn't much the Government can say. The most we can look forward to is a commission to probe the matter and eventually a report. @javed read again he intoxicated them and he was not alone three of his accomplice also arrested. @javed I think he has mental illness hence did not flee. The victims were intoxicated hence did not resist. @Leena , no value of human life in Pakistan. Rest of South Asia is ok.
@Thunder , what has durand line to do with it. @GENGHIS khan Government might have taken the notice of it. @Naxalite why? the educated don't commit crimes? @M Jamal Solve the Kashmir issue. Every thing will be peaceful in Pakistan. Culprits Should be served with as severe punishment as possible. If we keep our masses illiterate and uneducated and believe in superstition and hearsay and jadoo tona and pirs then these kinds of tragedies would continue. 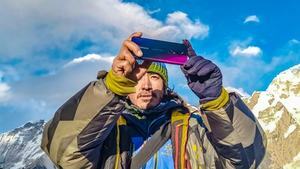 @Shauakat ali Japan Wala Suppose you received all the answers to the questions you have posed will it change the reality that 20 people lost their lives, that people still flock to these shrines, that many of these shrines are a land grab scam, that our religon never told us to go to shrines in the first place, etc.? Its really very tragic news, please show suspects faces, may be more victims will come forward. @Horseman One one doesn't want to see truth one cant help. A former employee of Election Commission and such a rogue and vicious? What could have not happened to the results. @Anis .. I don't believe it to be a religious matter at all. It's the work of a demented man. All over the world such type of incidents happened, either at holy place, or hospital even at resident also. Not location but mentality matters. Innocent people are deceived by so-called spiritual entities. Common people should know that so-called spiritual persons play with their emotions and reject them. This is horrible. To think that the VICTIM's families won't file charges because they believe in this man to be a Saint and that killing their family members was part of their God's plan??? No wonder they are doped up! These people allow themselves to be killed. How sick is that? Brain washing is not just in politics, folks!! A pir from havelian also tried to execute such mission before my very own eyes and has been reported to police even victems did report as well but this pir status goes long way even police itself takes it as nonsense. So what right after 8 months this pir's mureedins turned voilent and crushed the reporting victem now a martyer and it just didnt stoped there. The widdow is also still the very target of pir just to grab their property which is infront of darbar and it all has to do with this mission. Motives of such barbarianism is just to rule darbar who ever comes in the way geta crushed by pirs all the time and authorities most of the senoir officials support them because of pirs political connections or religious look alike reasonings.